유학의 대표적 경전인 『論語』에는, 孔子나 그 高弟, 또는 三家와 隱者에 의해 引用된 詩가 총 8편이 있는데, 이 중 와 , 등 3편의 引用詩에 대해서는 이미 孔子의 學問觀과 文質論을 중심으로 연구를 진행하였다. 나머지 5편의 引用詩들도 비록 錯簡 및 학자들 간의 異見, 詩 引用의 주체 등 여러 問題들을 안고 있으나 그 引用의 정황과 성격이 독특하다는 점과, 孔子의 핵심적인 思想은 물론 그 門人들의 性向과 價値觀 및 學問的 成就 등을 유추하는 데 중요한 端緖들을 찾아볼 수 있다는 점, 孔子의 詩敎論的 敎育 意圖가 내포되어 있다는 점 등에서 그 연구 가치가 높다고 본다. 本稿는 기존의 연구 성과를 바탕으로 하여, 이 5편의 引用詩를 중심으로 孔子와 그 門人들의 詩敎 및 價値觀 등을 조명하고, 詩 引用 상황과 목적, 詩 引用을 통해 열리는 새로운 가치 세계에 대해 분석함으로써 그 意味를 심도 있게 탐색하고자 하였다. 또한 學派나 學者들의 觀點에 따른 詩 解釋의 다양한 見解를 살펴보고, 孔子 詩敎의 敎育的 意義를 규명하고자 하였다. 먼저 孔子의 仁 實踐 意識과 詩 引用에서는, 錯簡說을 적극 수용하여 孔子가 詩 引用을 통해 仁에 대한 抽象的 定義보다 實踐하고자 하는 意識과 확고한 實踐 意志가 중요함을 詩敎로 깨우쳐주고 있다고 보았다. 둘째로 孔子의 節義論과 詩 引用에서도 여러 학자들의 견해 중 程朱의 錯簡說을 수용하여, 齊景公과 伯夷叔弟의 극명한 대비를 통해 결국 영원히 칭송받는 것은 富貴가 아니라 節義와 같은 그 사람의 德이란 점을 詩敎로 강조하려는 의도였다고 보고, 이를 儒學의 節義論的 觀點에서 분석하였다. 셋째로 曾子의 孝敬觀과 詩 引用에서는, 본인이 終身토록 실천한 孝敬을 弟子들에게 몸소 보여주면서 實踐의 중요성을 강조하고 敎育하기 위해서인 것으로 파악하였다. 이는 孝道와 恭敬을 평생 實踐했던 자신의 굳건한 意志를 보여줌은 물론, 孔子로부터 가르침을 받아 완성된 孝敬觀을 詩敎로 弟子들에게 전수한 살아있는 敎育으로서 큰 의미가 있다고 하겠다. 넷째로 他人의 詩 引用에 대한 孔子의 反應과 價値觀에서는, 詩 引用의 주체보다는 孔子의 反應에 초점을 맞추어 그 가치관을 파악하는 데 중점을 두었다. 三家에 의해서 周頌 <?>이 참람하게 使用되자 孔子는 <?>을 斷章하여 言及하면서 三家에게는 강한 경고를 보내고, 弟子들에게는 正名의 중요성을 일깨우는 詩敎論的 敎育 效果를 거둘 수 있었다고 보았다. 또한 과 관련해서는, 儒學의 義理論 중 가장 기본적 양상으로서의 出處에 관한 信念과 가치기준이 명확하게 드러난다는 점에서 의미가 크다고 보았다. 孔子가 詩를 인용하거나 언급해서 弟子들을 敎育했던 이유는, 학문의 진보와 인격의 성장에 시가 기여하는 측면이 매우 크며, 때로는 자기의 뜻과 理想을 전달하는 데 효과적이기 때문이었다. 孔子 詩敎의 특징은, 대체로 자기 내면에서 저절로 우러나오는 感發과 自發的인 懲創을 통해 더 높은 인격의 진보로 자연스럽게 弟子들을 인도하는 것이지만, 때로는 詩를 통해 實踐의 중요성을 일깨워주거나 가치 판단의 기준을 명확하게 제시하기도 한다는 점이다. 그것은 바로 孔子가 이러한 人才들로 인해 사회적 혼란과 분쟁이 終熄되고 理想的인 사회의 건설이 가능할 것이라는 기대를 걸고 있었기 때문이었으니, 이것이 바로 孔子가 『論語』에서 詩의 중요성을 강조하고 詩敎를 통해 敎育에 적극 활용하고 있는 이유라고 할 수 있겠다. One of representative scriptures of Confucianism, Analects of Confucius contains total eight poems quoted by Confucius, his eminent disciples, three families, and hermits. Of the poems, , , and have been topics in researches focused on Confucius' views of study and Munjil theories. The remaining five quoted poems have several problems including the wrong chapter orders, different opinions among scholars, and subjects of quoting the poems, but they hold great value in terms of research in that the circumstances and nature of their quotations are unique, that they provide important clues to infer Confucius' core ideologies and his literary figures' tendencies, values, and academic achievements, and that they contain Confucius' values and also his education intentions in terms of poetry education theory according to his values. This study set out to shed light on the poetry education and academic achievements of Confucius and his literary figures based on these five quoted poems by consulting the findings of previous studies. It also aimed to conduct an in-depth inquiry into the meanings of the quoted poems by analyzing the circumstances and purposes of their quotations and the new world of values that was opened by their quotations. Lastly, it intended to examine various opinions about poetry interpretations according to different perspectives of different schools and scholars and investigate the educational significance of Confucius' poetry education. First, the sections on Confucius' consciousness of practicing In and quotation of poetry accepted the theory of wrong chapter orders actively and found that he tried to make the point through poetry education that the consciousness of practice and the firm determination for practice was more important than the abstract definition of In by quoting poems. Second, the sections on his integrity theory and poetry quotation accepted Jeongju's theory of wrong chapter orders among the opinions of various scholars and found that he emphasized through poetry education that it was one's virtue such as integrity rather than one's wealth that would be praised for eternity through striking contrast between Jegyeonggong and Baekisukje. His emphasis was then analyzed from the perspective of the integrity theory in Confucianism. Third, the sections on Tsengtzu's viewpoint of filial duty and poetry quotation found that he emphasized and educated the importance of practice by demonstrating himself his lifelong acts of filial duty to his disciples. His teachings hold huge significance as living education that exhibited his solid determination of practicing filial duty and respect throughout his life and transmitted his viewpoint of filial duty, which he completed with the teachings of Confucius, to his disciplines through poetry education. 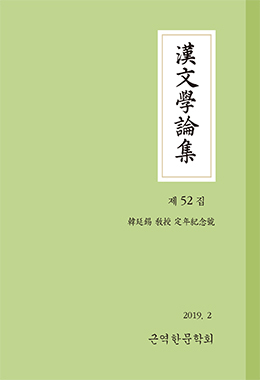 Finally, the sections on Confucius' reactions and values to others' quotation of poetry focused on figuring out his values by concentrating attention on his reactions rather than the subjects of poetry quotation. When the three families arrogantly used <?> by Jusong, Confucius mentioned it through its Danjang, which generated two effects of sending a strong warning to the three families and making his disciples realize the importance of Jeongmyeong. His mentioned about hold huge significance in that they clearly reveal his convictions and value criteria about sources as the most basic pattern of the Ui-ri theory in Confucianism. Confucius taught his disciples by quoting or mentioning poetry because poetry made considerable contributions to the progress of study and the growth of personality and was sometimes effective to convey his intentions and ideals. His poetry education was characterized by his natural guidance of his disciples to the progress of personality to a higher level through Gambal naturally emitting from one's inside and voluntary Jingchang. He also awakened his disciples to the importance of practice and clearly presented the criteria of value judgment to them through poetry from time to time. He brought up talents with much more mature study and personality and clear criteria of value judgment through poetry education, expecting them to put an end to the social confusion and disputes and build an ideal society. These were the reasons why he emphasized the importance of poetry and made active use of it in his education for his disciples in Analects of Confucius.